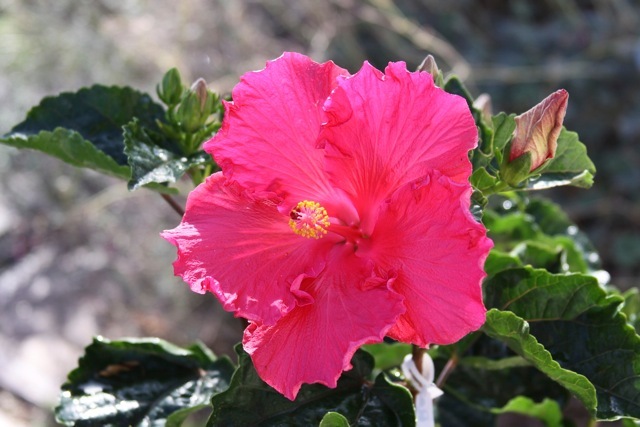 Part of The Beach™ Series: Varieties bred for large, showy blooms, named after famous beaches around the world. ‘Byron Bay Rose’ flowers are extremely showy with extra-large, single hot lipstick pink flowers blooming throughout warmer months. Vigorous upright, growth habit. Glossy green leaves on a vigorous, upright shrub to 2m tall and wide. Named for Byron Bay, a beachside town in New South Wales, Australia. Cape Byron, a headland adjacent to the town, is the easternmost point of mainland Australia. Captain James Cook named Cape Byron after circumnavigator of the world John Byron, grandfather of the poet, Lord Byron.